Let’s talk about your vehicle’s evaporative emissions control system; or EVAP for short. Your vehicle’s fuel system is sealed to trap vapors before they can escape into the atmosphere. The EVAP system draws in fresh air, gathers up vaporized hydrocarbons and delivers them to the intake system to be burned in the engine. If there’s a leak or a blockage in the EVAP system, a trouble code will be generated, setting off the check engine light. There are many EVAP system components that could have problems – things as simple as a worn or loose gas cap or a rusty fuel filler pipe. Other EVAP system components include the fuel tank, purge valve, canister vent valve, charcoal canister, the canister filter, the fuel tank pressure sensor, the fuel level sensor, electronic control module, vapor lines, and the vapor switching valve. As you can imagine, with a list like that, it takes some skill – and some specialized equipment – to properly diagnose an EVAP system problem. Your qualified service center will take a reading and perform a function test on the various valves. If necessary, a low-pressure smoke test will be performed to visually spot any leaks. Again, proper equipment is required so that the tests don’t cause further damage. EVAP system problems don’t usually hurt performance or cause damage. However, there are very good reasons for making the repairs. First, you only have one check engine light – but there are hundreds of problems that can trigger it. When you don’t fix an EVAP problem, the check engine light will stay on, masking other problems that might occur. Of course, if local regulations require passing an emissions test, your vehicle will fail. Finally, harmful emissions are being released into the atmosphere. If you have an illuminated check engine light – get in and have your vehicle diagnosed. You’ll want the peace of mind. 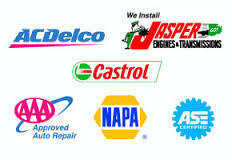 EVAP problems are in the top five reasons for the Check Engine Light to come on. Your service facility can properly diagnose EVAP system problems and other, more serious causes of illuminated Check Engine Lights. At Thomas Auto Service in Sevierville we install quality NAPA replacement parts. Call us at 865-429-2110. To learn more about NAPA AutoCare, visit www.NAPAAutoCare.com.